During the early part of World War 2 Paxman designed its famous 12 cylinder 600 bhp TP engine. The Company built more than 3,500 TPs, virtually all of which were supplied for main propulsion of British-built tank landing craft. How the engine came to be designated the 'TP' has been a matter of debate. The explanation generally given is that TP stood for 'three pieces'. The engine was a modified version of the Paxman VRB in which the crankcase and cylinder blocks were integral parts of one large, relatively complex casting. To make the TP suitable for large scale manufacture this casting was re-designed as three separate pieces, namely the crankcase and two banks of cylinders. Many more sub-contractors would be capable of casting and machining the smaller, simpler units than could make the large VRB block. This was a vital consideration if the engine was to be produced in the numbers and at the rate required for the war effort. An alternative view is that TP stood for 'tank propellant'. This opinion gains credence from the fact that the first application of the TP was as the propulsion engine for a heavy tank. The 12TP powered the initial prototype of the tank, known as TOG 1, and a second similar prototype called TOG 2. The TOG tanks have an interesting history. At the start of the war in 1939, Churchill and others were concerned that the course of the new war might follow the pattern they had experienced in 1917. Another bout of trench warfare in northern France and Belgium would call for a tank which was sufficiently heavily armoured to resist shell fire, light enough on the ground to traverse soft mud, and good at crossing trenches. A group of engineers and military personnel was brought together in 1940 to design just such a tank. Formed into the Special Vehicle Development Committee (SVDC), its members were mainly those who had designed the first tanks in World War 1. Because of this the Committee soon became known as 'The Old Gang', from whence the TOG tanks got their name. Two members of the Committee who had played a major part in developing the first tanks were Major Walter G Wilson (1874-1957) and Sir William Tritton. The former, of Wilson gearbox fame, had been a key figure in designing the transmissions for World War 1 tanks and had invented the preselector epicyclic gearbox, introduced in cars c.1930. Tritton was Managing Director of William Foster & Co of Lincoln. His firm had built the first tanks in World War 1 and, not surprisingly, Foster & Co secured the contract to build the new prototypes. The Committee was headed by Sir Albert Stern, who was for a time secretary of the First World War Landships Committee. Other members included Harry Ricardo (who had helped Edward Paxman develop the Paxman-Ricardo engine), Sir Ernest Swinton (credited by some as being the first to suggest the idea of the tank in 1914), and Sir Eustace Tennyson D'Eyncourt, one-time Director of Naval Construction. Work on TOG 1 commenced in February 1940 and the order was placed for a Paxman engine. Despite Walter Wilson's expertise in epicyclic transmissions, the Committee opted for a diesel-electric drive arrangement. Tony Marvin, who was working for Ruston & Hornsby (then Paxman's parent company) at Lincoln during the early part of the war, says the TP drove a large generator, which was actually two generators built into one casing. Each generator supplied a traction motor. The electrical drive equipment was designed by C H Merz of Merz & McLellan and made by the English Electric Company. A search among the records of Paxman's Service Department has successfully turned up details about the order for TOG 1's engine. The Department has filmed copies of various documents relating to the engine, the first of which is dated 3rd February 1940. It refers to Order No 50156, noting that it is for the first TP. This confirms the previously held view that the first TP to be produced was used in the tank. The document also notes that the engine is for Fosters of Lincoln, and refers to an order for a second TP, Order No 50158. Another document dated 23 April 1940 refers to Order No 50156, to two TPs for MOS (Ministry of Supply), and states 'parts to be sent to R&H for building up'. One wonders whether Ruston & Hornsby was given the task of erecting the engine because of lack of capacity at Colchester, or perhaps there were seen to be advantages in having the engine builder close to the tank builder in Lincoln. A third document dated 29th May 1940 shows that No 50156 is to be sent to English Electric Traction Motors Test Department at Phoenix Works, Bradford, and notes 'Fosters of Lincoln and MOS to be advised'. There is also a list of ancillary items to be supplied by Paxman on loan to English Electric for the purposes of the test. Another document dated 24th June 1940 sets out a 'Programme for inspection after long run'. The first trial of TOG 1 took place on 27th September 1940, followed shortly after by the first official demonstration on 6th October. During trials, which continued until June 1941, a recurring problem was overheating of the electric drive motors. This presumably was the issue lying behind a decision to replace the electric drive with a hydraulic system. The equipment for the new drive was supplied by the Hydraulic Coupling and Engineering Co, and conversion took nearly two years to complete. The tank first ran with the hydraulic drive in May 1943 by which time it was redesignated TOG 1A. After a month of intensive testing it went back into the factory for further modifications. Alterations were still being made as late as spring 1944. TOG 1 was subsequently transported to Chobham after which nothing more was heard of it. The order for TOG 2 was placed on 6th May 1940. The most obvious difference from TOG 1 was in the layout of the tracks. Diesel-electric drive was retained for this second prototype, notwithstanding the problems of overheating electric drive motors encountered with TOG 1 and the consequent conversion to a hydraulic drive system. There appears to be no record of TOG 2 having any similar problems. Tony Marvin recalls that, unlike TOG 1, it had two separate generators, set side by side, driven by the TP through a gearbox. TOG 2 ran for the first time on 16th March 1941. Six months later it was decided to make various modifications and the tank's name was changed to TOG 2*. Substantial changes were made to the final drive, the most important being the adoption of sprung, torsion bar suspension which was fitted in April 1943. The modified tank performed faultlessly in trials throughout May 1943. However, the conditions for which the TOG had been designed were never likely to materialise after the fall of France in 1940 and the War Office showed no interest in placing any orders for it. Plans were prepared for a shorter version of the tank called TOG 2R (Revised) and there were even suggestions of building a TOG 3, but neither were developed. 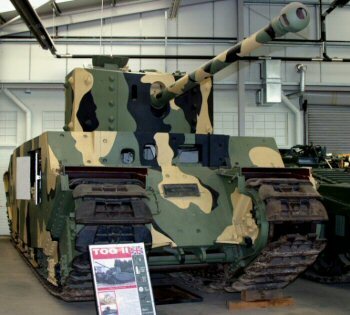 TOG 2 has survived and is now on display in the Tank Museum at Bovington, still with its TP engine. The heaviest tank in the museum, it weighs 80 tons, is 33' 3" long, 10' 3" wide, and 10' high. Designed for a crew of six, it had a maximum speed of 8½ mph. Most of the details given here about TOG 1 and TOG 2 come from David Fletcher's book, The Great Tank Scandal - British Armour in the Second World War, Part 1 , published by HMSO 1989 (ISBN 0 11 290460 2). 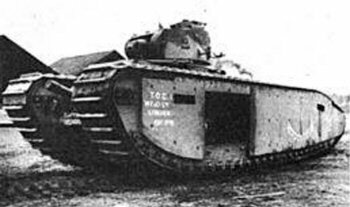 The TOG tank was designed by World War 1 veterans for World War 1 conditions. This shows in the outward appearance of the two prototypes. However, the anxieties of Churchill and the Old Gang that the new war might see a repetition of trench warfare in northern France were never to materialise. The rapid advance of the German Panzer divisions into northern France in May 1940 immediately changed the course of the war and its likely future. It is therefore surprising that three years later, in May 1943, work was still going on with trials of both TOG 1 and TOG 2. In fact alterations were still being made to TOG 1 a year after that. A great deal of expertise and effort was expended to no effect. In the words of David Fletcher: " . . the TOG tanks were built for a war that would never happen, or rather for a war that had happened over twenty years before." The TOG tanks were not the only World War 2 tracked military machines to be powered by Paxman TPs. An idea of Winston Churchill, and developed at the same time as the TOGs, was a large excavator or mechanical mole. Given the name of Naval Land Equipment, it is described in the 'Nellie' section on the Britannia Works page. It is interesting to note parallels with the TOG. Both were a response to concerns that Britain might again be caught up in trench warfare in northern France. The prototypes of both were built in Lincoln. (The Nellie prototypes were built by Ruston-Bucyrus, in which Paxman's then parent company, Ruston & Hornsby, had a 50% holding.) In both cases the reasons for developing them were overtaken by events in May 1940 but the development of both continued long after that, and neither were ever to see active service. In the minutes of Paxman's Board Meeting held on 26th May 1938 it is noted that "Mr (Edward) Paxman reported that he had had an interview with Admiral Sir Harold Brown regarding the use of Diesel Engines for tanks and the matter is proceeding satisfactorily". It is interesting that Paxman was looking at the matter of engines for tanks as early as this and that the discussions were with the Admiralty, not the Army. Minutes of Board meetings during the months that followed cast no real light on the outcome of these discussions.